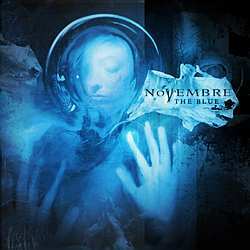 Review: "Novembre: The Blue" - Sea of Tranquility - The Web Destination for Progressive Music! The Blue successfully expands on the sound experiment of Materia, the previous Novembre album, but also brings in elements from their earlier works. On some songs, it is easy to notice the mix of powerful death metal elements and the more mellow yet progressive side of Materia. Contrary to their previous disc, The Blue exudes greater use of death metal-styled vocals and screams from Carmelo Orlando, but he hasn't abandoned his sombre clean tone completely. Actually, most of the tunes on The Blue boast his unmistakable clean singing a la Materia, such as "Cobalt of March" with its Ulverian intro and excellent guitar cascades; "Bluecracy" with its penchant for melodic guitar lines and groove-oriented rhythmic facade; or "Architeme" with its detailed Radiohead-like arrangement, something which has been carried over from Materia as well. That said, the same songs are also filled with Orlando's pain-ridden screams as well as growls and whispers. The aforementioned "Bluecracy", for instance, brings forth his entire vocal spectrum, as he starts with his somewhat upbeat clean voice, then mixes it up with his hate-infested screams and finishes with creepy whispers. However, the balance of the whole song is maintained due to the clever inclusion of melodic guitar work. Moreover, on "Sound Odyssey", the band's extreme sides are interwoven into a melodic framework. It begins with the saddest acoustic guitars and synths you can imagine before alternating vocal parts take the lead, with the clean singing perhaps being the album's high point. The demonic screams of "Cantus Christi" are sheer emotion not to mention the accompanying guitar theme. The very fact that Novembre infuses wonderful guitar themes into their songcraft is testimony to their formidable songwriting. They avoid overusing a melody or theme no matter how powerful it is. The same method has been applied to "Nascence", where Carmelo Orlando is joined by female vocalist Francesca Iacorossi (Oblivio), and while the main melody of the piece is godly, it is used in a very restrained mindset. The vocals are simply fantastic, exchanging stanzas and even lines before the song climaxes with a highly emotional guitar solo. Two tracks on the seem to be quite personal, one of them being "Triesteitaliana". A song penned about Italy's northern border town Trieste, it manages to merge plenty of contrasting moods in its four-minute running time. The drumming on this song is awesome, and Orlando's slightly gothic-toned delivery works very well when countered by his trademark screams. Also, the almost entirely instrumental piece "Zenith", perhaps the band's best moment, moves through many passages, and also features a wonderful flute arrangement with ethereal keys lingering over it. The final verse, at less than thirty seconds, is the same verse of "Come Pierrot" from the band's complex album Novembrine Waltz. Unless I'm mistaken, "Argentic" is the only tune on this song with all clean vocals, but, while good, does not come close to capturing the same level of intensity of the Materia songs. Though it would be unfair to compare The Blue with its predecessor, I feel Materia was a more thorough effort with staggering moments and unmatched songwriting excellence. The album was mixed by Finland's legendary Mikko Karmila and, thus, maintains a stylistic similarity to later day Amorphis and Sentenced. I do think the production of Materia is better, but then again, no Novembre album could equal it. This disc should please those who complained about Materia being too mellow, so here is something more aggressive showcasing Novembre's brutal side without fully ignoring their progressive leanings. Once again, Travis Smith's artwork is amazing. The band should never even think of working with another artist.